With a dinnertime mystery and 5 hungry suspects, Charlie Piechart makes fractions fun. Charlie Piechart has a piechart for a belly, and it’s a belly that’s perfect for showing fractions. In his first mystery, perfect for little math enthusiasts, it’s pizza night at the Piecharts’ house. How about veggies on top? “NO VEGGIES!” yell 4/6 of the pizza eaters. No one wants anchovies, either. They like Charlie’s idea best: pepperoni. But with 6 pizza eaters, 3 sizes of pizza on the delivery menu, and 2 slices allotted for each person, it is no surprise when there’s a mystery! A scream from Charlie’s sisters reveals the issue: 1 out of 12 slices has gone missing. So who did it? Charlie counts the suspects and questions each one (except Mom!). But could he be forgetting someone? This colorful, hysterical mystery adventure is perfect for both reluctant and enthusiastic math learners. Great for fans of G Is for Googol, Sir Cumference and the First Round Table, and Math Curse. Marilyn Sadler has written more than 35 books and has won 12 awards. She received 1 Emmy nomination for her animated series, Handy Manny (which averaged around 2 million viewers a week!). She is the author of the P. J. Funnybunny books and the books about Alistair. Marilyn lives in Ohio with her cat, Alice, who’s shaped like a half sphere when she is sleeping and who acts like a princess when she’s awake. Marilyn is 1/2 of the team that created the world of Charlie Piechart. Visit her online at www.marilynsadler.net. 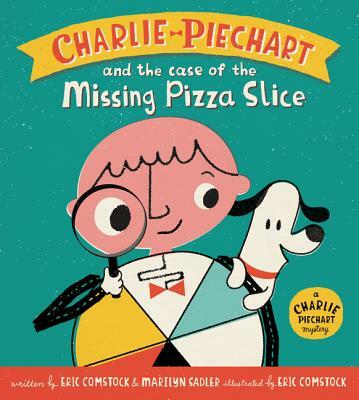 Eric Comstock has illustrated and coauthored 3 books about Charlie Piechart. Eric lives in Austin, Texas. Eric loves shapes. He prefers his grilled cheese sandwiches cut in triangles, not rectangles. He likes to drink his coffee out of a cylinder with a handle. And his ice cream must always be eaten from a cone. If you look at his illustrations, you’ll see characters that are made out of triangles, squares, rectangles, and circles. You can see what shapes Eric’s using lately at ericcomstock.us. A lighthearted tone and newcomer Comstock’s playful graphics, which have a weathered, retro quality, make the lesson go down as easy as pie. Debut illustrator Comstock’s digital artwork is a retro-modern throwback. Kids will have fun following Charlie as he solves the mystery and reinforce their fraction skills along the way.